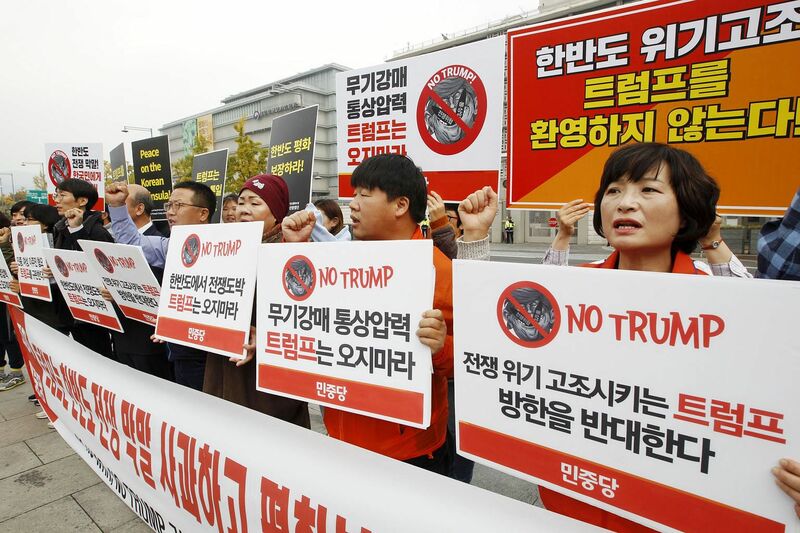 SEOUL • For more than a year, China has railed against South Korea, calling for boycotts of its products over Seoul's decision to let the United States deploy an anti-missile system, which Beijing fears threatens its own security. On Tuesday, however, China abruptly changed course, essentially saying "never mind", as the two countries agreed to end their dispute even though South Korea is keeping the system in place. China's unexpected move to settle the rancorous dispute could scramble US President Donald Trump's calculations about how to deal with allies and North Korea on the eve of his first trip to Asia. The decision by Chinese President Xi Jinping appeared to reflect a judgment that China's continued opposition to the deployment of the US missile defence system was not succeeding in fraying the South Korean government's alliance with Washington. But it could also pose a fresh challenge to Mr Trump as he attempts to build support in the region to put greater pressure on North Korea to curb its nuclear and missile programmes. South Korea's liberal President, Mr Moon Jae In, is more receptive to diplomacy with the North Koreans than either Mr Trump or Japanese Prime Minister Shinzo Abe. Drawing Mr Moon closer to Beijing, analysts said, could create a new alignment on how to deal with the North, with China and South Korea facing off against Japan and the US. "It's going to undermine the Trump administration's effort to build solidarity among the US, Japan and South Korea to put pressure not only on North Korea, but also on China to do more on North Korea," said Mr Michael J. Green, an Asia expert at the Centre for Strategic and International Studies. Much about the rapprochement is not known, he cautioned, and the Chinese could be exaggerating the implications of the agreement. But it adds yet another volatile element to Mr Trump's 12-day, five-nation tour of Asia, which begins this weekend. Formally, the Trump administration welcomed news of the thaw. The US State Department spokesman Heather Nauert told reporters on Tuesday: "We see that as providing better stability, greater stability for a region that desperately needs it because of North Korea." Ms Nauert, however, said she did not know whether China's move indicated it no longer had objections to the deployment of the anti-missile system, the Terminal High Altitude Area Defence, or Thaad. In agreeing to restore cordial relations, South Korea pledged not to accept additional Thaad launchers and agreed not to join a regional missile defence system with the US and Japan. The agreement to not accept any more Thaad deployments had been a longstanding policy stance of Mr Moon anyway, a South Korean government official said on Wednesday. In warming up to South Korea, Mr Xi probably recognised that Mr Moon would be more malleable to favouring dialogue with North Korea than was his conservative predecessor, Park Geun Hye. The rapprochement carries risks for the US. How far Mr Moon would now lean towards China is something that Washington needs to watch closely, said Mr Evans J.R. Revere, a former State Department official who has dealt with the Korean Peninsula. In agreeing not to join a regional missile defence system, South Korea is addressing China's concerns about what it views as the US' aim to "contain" China. For Mr Moon, the Chinese government's efforts to discourage the purchase of popular South Korean goods as punishment for the Thaad deployment has taken a toll. China is by far the biggest trading partner of South Korea; two-way trade is bigger than South Korea's trade with the US and Japan combined. The Hyundai Research Institute found that the Thaad dispute was likely to have cost South Korea US$7.5 billion (S$10.2 billion) so far this year, a 0.5 per cent hit to its gross domestic product. China lost US$880 million, just a 0.01 per cent drop of its GDP, the institute said.